The RAS/ERK MAP kinase pathway is aberrantly activated in a large percentage of human cancers, and promotes malignant behavior. Inhibitors of MEK, one of the key intermediates in this pathway, have had limited utility in the clinic, often due to the rapid development of “intrinsic resistance.” Intrinsic resistance is due to up regulation of multiple growth factor receptors and their ligands, and previous work by the lab and by others has shown that is required for RAS activation by these receptors. 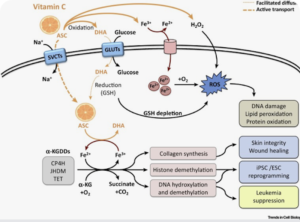 Here we found that combining MEK and SHP2 inhibitors shows broad efficacy against a wide range of malignancies, and also that SHP2 inhibitors as single agents can antagonize certain types of RAS mutations (fast cycling mutants). 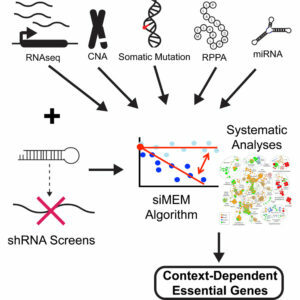 This paper presented the largest (at the time) collection of genome wide shRNA screens of human breast cancer lines, all linked to genomic (mutations, copy number variants, RNAseq, miRNAs) information and RPPA, along with detailed informatics analysis that suggests functional classifications of cancer vulnerabilities.